The best souvenir any traveler can have is a deep and meaningful connection with the places and people they visit. Understanding the history of the Imlil Valley will put into context the lives of the locals and enrich your vacation. That’s what this website aims to do. – encourage understanding of the local culture and promote the area as an ideal destination for tourists seeking a sustainable experience. The triple bottom line is just that — the bottom line when calculating the impact of your vacation. How does it affect the environment, economy, and people of the destination? How does your visit affect the local economy? Where is the money you spend (on hotels, restaurants, tours, etc) really going? Does it leave the area? Does it leave the country? Or does it stay in the place you are visiting and help grow the local economy? We all know better than to litter, not to remove or destroy local flora or fauna, and to keep the place looking like when we found it (or ideally, better!). CHALLENGE: instead of thinking in the short term (i.e. : I won’t leave this plastic water bottle in the mountains, I’ll bring it back to town and recycle it) commit to the long term and purchase a re-usable water bottle. Remember, plastic never goes away. When it comes to respecting culture there’s a golden rule: do as the locals do. Why? As you will note, the local culture is quite modest and it’s a very rare site to see even local men in shorts. Naturally this goes double for women. Keeping in line with the culture helps to promote an attitude of respect and concern for your hosts. A quick and easy way to know if your dress is appropriate: dress to the joint. Keep it covered at least until the knee and elbow. Covering up with loose and lightweight clothing means that even in warm summer months you’re earning respect as well as giving it. – Be mindful of your hands and feet. Why? The left hand is generally considered unclean, so receiving a gift, offering money, or using it in greeting is seen as offensive. The right hand is the appropriate hand for all transactions and especially for eating. As in many cultures around the world, the feet are also seen as unclean. Avoid pointing them at people or stepping over them as this is seen as rude. In general Morocco is a very moderate country when it comes to Islam and is welcoming of tourists knowing full well that they are bound by different rules, however all efforts to be respectful are noted and appreciated. – Don’t being flashy with material possessions. Why? This can cause frustration, jealousy, or even despair and create tension between hosts and guests. Especially when it comes time to making purchases and attempting to barter over 5 or 10 euro while showing off a phone that costs hundreds of euro. – Show restraint when it comes to public displays of affection. Why? Again this falls under modesty. As a rule, save the hugging and kissing for behind closed doors. Even hand holding can be distasteful and offensive once outside of cities. 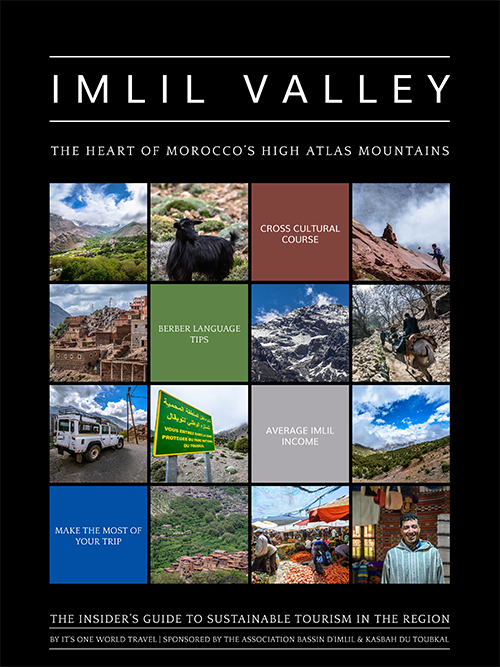 To learn more — including a quick Berber Language Guide — download the Responsible Tourism in the Imlil Valley PDF. This brochure will enrich your visit to the area, by knowing a bit more about the people and understanding their way of life you’re going to arrive to Morocco feeling like you’re visiting friends — and isn’t that the goal of a good vacation? If you have any further questions or comments about the brochure please feel free to reach out to us here. If you’re a tourism destination that would like a guide like this created for yourselves please get in touch here. To contact the Association of Imlil with questions, comments, or donations to further their work please contact Mike McHugo here.